The Florida Disabled Outdoors Association (FDOA) is a non-profit 501(c)(3) organization that is working to enrich lives through accessible inclusive recreation. Since its inception in 1990, the FDOA has promoted accessible recreation to persons with disabilities as well as the general public through its hands-on recreation programs, newsletters and community outreach and education. FDOA has also assisted in compliance of the Americans with Disabilities Act and worked closely with many state, local and private organizations to develop, enhance and/or support recreation opportunities for the people with disabilities across Florida and beyond. It is rare that someone can take a “tragedy” as an opportunity to change their life and help others. That is exactly what David Jones did. His injury became a personal commitment to help others. In 1988, David Jones was shot in a hunting accident resulting in a serious head injury that left him with permanent paralyses of his left leg, limited mobility and no use of left hand. David utilized a wheelchair for one year, then gradually increased mobility to the point where he could walk with a walker and now walks with a slight limp without any device. He remains paralyzed in one arm. In the process of his rehabilitation, he became aware of the importance of recreation for rehabilitation – not only to improve mobility, but to improve mental well-being. David saw this event in his life as a challenge and an opportunity to assist others. This life changing event developed into his personal crusade. David went back to school and received his bachelor’s degree and with his degree in Marketing learned that an effective organization fills a need that is not being met. 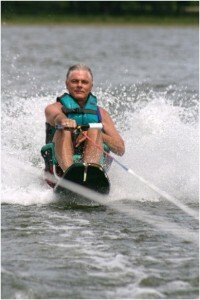 David Jones overcame the challenge of his disability utilizing sports for himself and others by forming the Florida Disabled Outdoors Association in 1990. The Florida Disabled Outdoors Association has grown since that point to have multiple programs including, the Recreation Activity Program for Adults with Disabilities, ALLOUT Adventure Program, Miracle Sports, Community-Based Therapeutic Recreation for People with a Brain or Spinal Cord Injury and SportsAbility. The Americans with Disabilities Act (ADA) was signed into law on July 26, 1990. The civil rights law makes it illegal to discriminate on the basis of disability in employment, services of government , transportation, places of public accommodation, and commercial facilities. This includes leisure and recreation programs, services and activities. Society has recognized its responsibility to treat all people equal, and realizes the benefits of such. Passage of the ADA did not instantly fix the problem, but the law has created awareness of the issue and started the changes in accessibility that advocates have pushed for two decades. Progress and change will come from the very people who have disabilities and the groups that represent them. There is a need to provide input and assistance to the managers of our natural resources in planning and implementing accessible and barrier-free outdoor recreation programs. It is just as important is the need to inform the public of these opportunities. U.S. Fish and wildlife Service – accessibility training for wildlife refuge managers from fifteen states. Saint Marks Wildlife Refuge – designed and implemented mobility impaired hunting program and FDOA volunteers host the event every year; consulted for design of courtesy boat dock facility. Florida Department of Environment Protection – consulted and assisted in the creation of ADA compliance and self-evaluation program. Department of Environmental Protection /Parks and Recreation – assisted in on-site evaluation of all District II State Parks. Served on strategic planning committee; member state park group- users advisory board; ADA committee member for Friends of State Parks. Florida Game and Fresh Water Fish Commission – assisted in evaluation and consultation of accessible state boat ramps, assisted in design of accessible fishing facilities; also directly responsible for development and expansion of mobility impaired hunt program. Florida Water Management Districts and Eglin Air Force Base – initiated and assisted in development of mobility impaired hunt programs. Hands Helping Anglers – as a committee member, expanded fishing derby for disabled anglers, now over fifty per year. City of Tallahassee Parks and Recreation – assisted in self-evaluation of city parks and facilities. In addition to the aforementioned progress, the FDOA has hosted numerous adventure outings for persons with disabilities, including: scuba diving, deep-sea fishing, canoeing, and hunting expeditions for deer, turkey, quail, duck and dove.